Starting a business could be the best move you ever make, and Mercian Accountants are here to help you grow your business from the very first day. Whatever sector your planning to operate in, you’ll have to decide which of three business structures is ideal for you. These are sole traderships, partnerships, or limited companies. Quite simply, a partnership is a business that is formed and operated jointly by two or more people, rather than being the exclusive domain of one person, as is the case with a sole trader. This brings many benefits as the risk of the venture can be shed equally between the partners, rather than being taken on by one solo entrepreneur. It also means that more than one person can make an initial investment in the company, and this in itself can also make it easier to obtain funding from external sources. Partnerships often mean that the business also has access to a wider skill set, with each partner concentrating on their own particular area of the business. They are relatively easy to establish, but it’s essential that the partnership is formed correctly, both when it comes to creating a legal agreement between the partners, and registering the partnership with the tax authorities. Our expert team can help you with that, and so much more. How Can We Help Partnerships? These are just some of the services we provide. Our aim is always to dispense with the jargon and red tape, and make it easy for you to run your partnership. When you’re not spending time juggling your accounts, you can devote more energy to taking your business to where you want it to be. Whether your partnership is in its infancy or has been trading for a number of years, we provide a truly bespoke service that’s tailored to meet your specific needs. We believe in forming a close relationship with our clients, so we’re always available whenever you need us. As your partnership grows and your revenue increases, you may begin to think of incorporating your business as a limited company. We can take you through the pros and cons of this move, and provide you with a seamless transition. 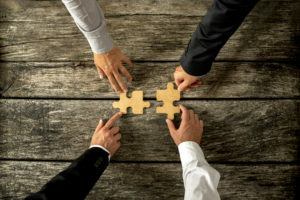 For the inexperienced business person, the tax rules pertaining to partnerships can seem particularly daunting, but it doesn’t have to be that way. We can explain your tax liability in simple, easy, terms and ensure that you pay the correct amount on time so that you won’t have to worry about fines for late returns. Partners are individually and collectively responsible for the business which they run. This means that each partner within the business has to complete a self-assessment tax return by the close of January every year. As a partner, you will be jointly and severally liable for both your business's debts and profits. This is where it can seem a little complicated, but our highly qualified accountants will take care of the process for you from beginning to end. This not only means completing and filing the self-assessment tax return on your behalf, it also means ensuring that you claim all of the allowable business expenses so that you’re not paying more than you really should be. We’ll advise you on how to claim relief against your tax liability for your share of any trading losses. We can also help you claim capital allowances on the capital expenditure that was vital for your business. Mercian Accountants are committed to saving you both time and money, and those are the most vital assets for any business partnership. The world of business is changing on a daily basis. Technological advances have changed the way we buy and sell things, and how we communicate with each other, opening up new markets and new opportunities for businesses in the United Kingdom. Despite this, many businesses are using traditional paper-based accounting methods rather than embracing the benefits that new technology can bring. Mercian Accountants are proud to use the latest accountancy software, and our technological expertise is giving our clients in Shropshire and beyond a competitive advantage over their business rivals. Our real-time online bookkeeping service lets all the partners in the business see an accurate statement of their accounts whenever they wish. We can also produce in-depth reports and accurate business plans to impress your stakeholders and potential sources of finance. You can say goodbye to last minute panics as the self-assessment deadline looms, and you’ll know exactly how much you’ll need to pay to HMRC long before the tax return is submitted. This allows you to plan ahead more successfully, contributing to the real and sustainable growth of your partnership.